I think it’s important to try and have a job where you don’t have to take your problems home with you. Unfortunately it doesn’t work out that way for a lot of people. I find that it can help to occasionally try and put things in perspective. Think about what is really important in your life and don’t let the daily grind get you down. 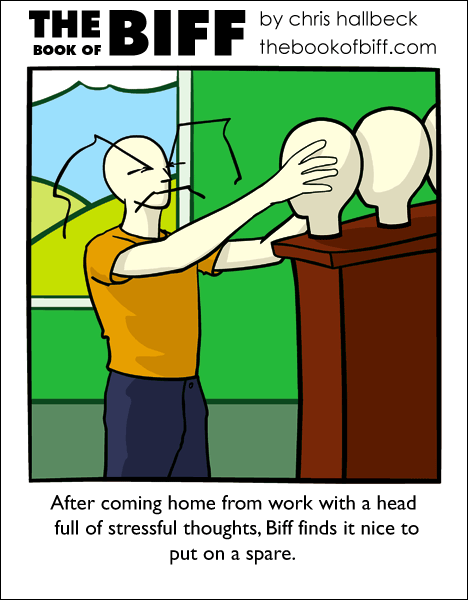 It’s good to know that even Biff suffers from stress. I suppose, despite all of his far-out accidents (anti-grav, anyone? ), he’s pretty human. lol, where can i get a few of those?? awww i want more than one head!! Secondly, where are the eyebrows on Biff’s extra heads? Perhaps they sprout from his head when he puts it on? dont you know? he just pulls them off and reattaches them! theyre velcro’d! geeklord: You see, what’s going on is sort of like the build a bear workshop. Biff picks a head, then picks the eyebrows, the mouth, etc. Thing is, he doesn’t have much selection other than the regulars. actually cyber95, theres an easier solution…. He takes them off and puts them on the new one. oor it could be like mr potato head! I would say this explains Biff’s recovery from attempting use powertools to unstick a song from his head. That my friend is suich an AWESOME idea! I want one, ot two, or three or FOUR! Ohh that it were so easy! Sometimes the labels come off, and I wear an old worry before I realize where my head is. This soooo reminds me of “The Return to Oz” with Mombi. Any body else remember that? She had a hall full of heads. Scary when you’re a little kid. I would love to have extra heads to put all my thoughts in. That would feel so good. Woo… one minute till tomorrow and I’ve reached the latest post. I’ve just read all of the Biff comics thus far. Chris, you are brilliant. I hope you keep up the good work, because I will be reading this regularly for quite sometime. I really like to keep my problems sepret too. I guess I can do it esaliy because I don’t tell people my problems to begin with, so I can keep them in my head and where they need to be. Awesomeness, Chris. still. it’s kinda like a pensieve. (i know, i’m a dork). There’s one thing I realized–it doesn’t say he takes off his old one. Beware the horrors of the two-headed Biff! I sure wish that sometimes I could swap out my worry-filled head for a truly-vacant Biff head. Hey Cyber does he have to do that heart dance thing too? I had my head replaced once, but I didn’t read the contract/waiver thingy. Apparantly, the brain was optional. I’m a contractor working in IT, so I get paid by the hour. The amount of times I have brought problems home with me in my head and then at 3 in the morning I wake up with the solution. All that time that I didn’t get paid for. I wish I could take my head off at the end of the day. I guess the ‘brows are clip on. Also, check out doctor Wily on Metroid Third Derivative on Bob and George’s subcomics. The brows…. This raises an important question. Is Biff a crash test dummy? walrus, I strongly believe that Biff is actually somehow related to Buster from Mythbusters.